The Bermuda triangle, is a shape that often appears after a mid-point invasion of a three space extension on the fourth line, in handicap games. It is a kind of shape that the player suffering the invasion has to avoid. In this way it is fundamentally different from the same type of invasion on the third line. This triangle spells danger, hence the Bermuda triangle. 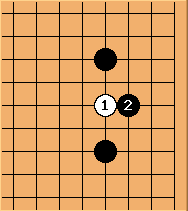 Black plays the contact play of , mistakenly intending to connect underneath. White applies basic instinct and hanes at . Black suddenly gets caught by fear and draws back at . makes a beautiful full triangle. is severely weakened (blighted). 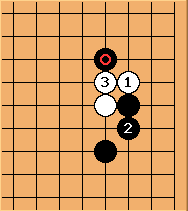 Black's position is cut to pieces. The advantage of having two stones in that zone to begin with has vanished. For better responses, see Fourth Line Invasion With One Space On Both Sides. For discussion of a continuation, see don't provoke damaging plays on the second line.